Shelley’s work was absolutely stunning in my opinion. Right when I saw it I knew that I wanted to write about it. It was a pleasure being able to actually talk to him about the work too. Shelley is a ceramicist but also makes a lot of his work out of glass. This specific showcase of work had a lot of his glass pieces. 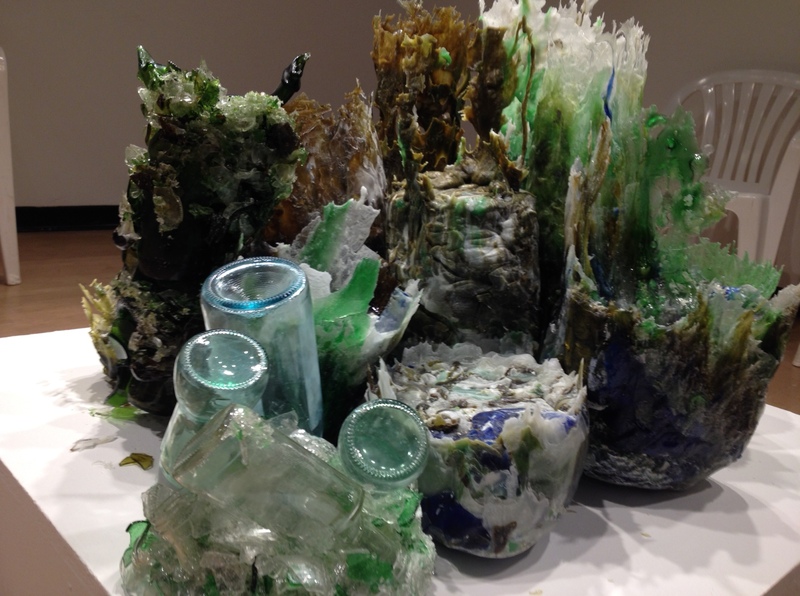 For these pieces he uses recycled glass that is all from the CSULB on campus recycling center. He melts it all down and then creates his own masterpieces. He is inspired by glass because it used to be such a valuable thing and now is so common. The glass is delicate and can break which adds to the thrill of working with it. I was so drawn in because I make jewelry out of rubbish, specifically bottle caps. It was awesome to meet an artist who has similar passions as me and is interested in reusing materials. Another thing that inspired me was that he doesn’t have specific titles for his pieces. He likes it to be open ended so that the viewer can have their own emotions and ideas from seeing the art. This piece specifically stood out to me. It reminded me of the ocean. I loved the sharp edges that stood up from the cylinders. The colors were also beautiful to me. I was blown away by the shapes involved as well. I learned that it takes about three weeks or longer for a piece of his to be completed. The amount of work and precision put in is awing. Posted in UncategorizedTagged #art110, MaccabeeShelleyBookmark the permalink.